If you live in Novato or spend time there, especially around the holidays, you can't help but notice the beautiful horse-drawn carriages traversing the length of Grant Avenue, and making their way around town in search of the most magnificent holiday light displays. These classy but decidedly old-fashioned vehicles are owned and operated by Novato resident Gary Sello and his Indian Valley Carriage Company. 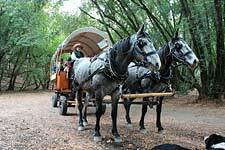 If you're looking for a family outing in Marin that is truly unique, fun, and stress-free, then you should consider the offerings of Indian Valley Carriage. 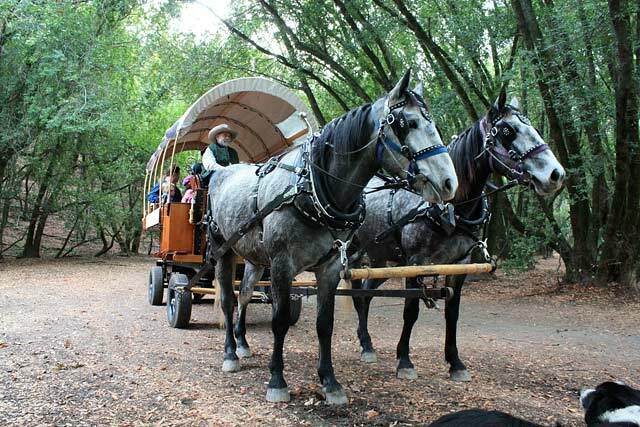 Based in Novato's rural Indian Valley neighborhood, Gary and Indian Valley Carriage operate several different carriages, including a formal black and maroon vis-à-vis (where up to six passengers sit facing each other), a three-seat surrey (with a fringe on top!) that can carry four to six passengers, and a large covered wagon that seats up to twelve. This Christmas season, Indian Valley Carriage's popular holiday lights tours start up the first week of December. Passengers can ride in either the six- or twelve-person carriage for a 55-minute tour of magnificent decorated houses, culminating in a visit to the amazing Rombeiro Christmas house (AKA the Novato Christmas House) on Devonshire Drive. Gary also offers numerous other services, including summer evening and moonlight rides, private parties, and weddings. The horse-drawn carriages also make for great birthday parties for children of all ages. Kids love to ride in the carriages and of course be seen riding in them, and popular destinations in town include Powell's Sweet Shoppe for candy and gelato, the ice cream store, and local restaurants. Gift certificates are available, too. With a group of friends and family, we recently took a ride with Gary around Indian Valley. 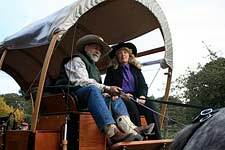 We rode in the big covered wagon, drawn by horses Beau and Honey, and it was a great day out! 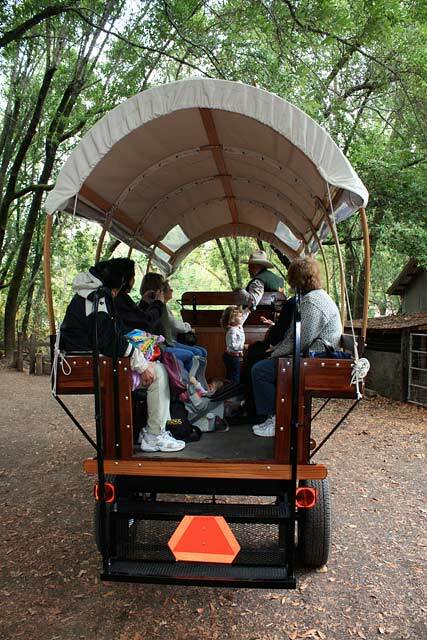 The wagon itself is comfortable, with rubber truck tires for an easy ride, a weatherproof top with big windows to allow for visibility and fresh air, and cushioned bench seats. We rode down Indian Valley Road, and then up the fire road in the nearby Indian Valley Open Space Preserve. It was like a trip back in time as we rolled through the quiet oak and bay forest and waved to hikers, bicyclists, and equestrians passing by. The ride was leisurely, relaxing and, above all, fun—definitely a memorable experience. It's also worth mentioning that Gary and his partner Jana are two of the nicest people that you're likely to run across in your life. Their openness, warmth and good humor made the trip especially enjoyable. 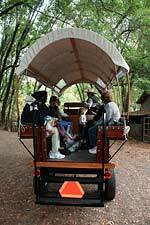 You can learn more about Indian Valley Carriage by visiting www.indianvalleycarriage.com. Prices for the Holiday Lights Tour (as of this posting date) are $125 Monday through Wednesday when he runs the six-passenger carriage, and $300 Thursday through Sunday when the big twelve-passenger covered wagon is in use. For additional price information, availability, and questions, call Gary Sello at (415) 309-8618.